The melodic minor scale seems to be a big mystery to many jazz musicians. The purpose of this article is to shed some light on this mysterious scale without going into too much technical detail. 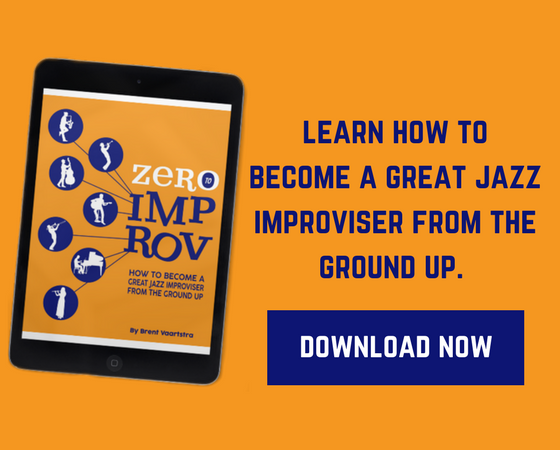 Further study on your own can reap tremendous rewards in your improvising by playing around with some of the ideas introduced in this article. The melodic minor scale has all of the same notes from the parallel major scale starting on the same note, except it has a b3rd instead of a natural third (since it is a minor scale). In classical theory, the melodic minor is unique in that the 6th and 7th scale degree are different depending on whether you are ascending or descending. It ascends 1, 2, b3, 4, 5, 6, 7, and 8, but descends as a natural minor scale, with the lowered 6th and 7th (8, b7, b6, 5, 4, b3, 2, 1). 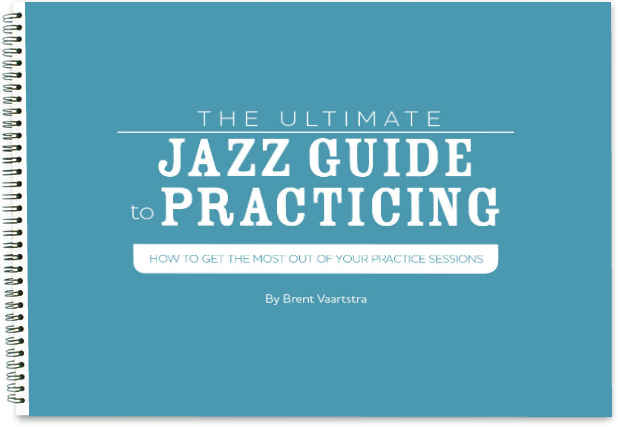 However, in jazz, scales are vehicles for improvisation, which means that it doesn’t make much sense to have two different pitch collections for ascending and descending. Thus, for the jazz musician, the melodic minor scale is 1, 2, b3, 4, 5, 6, 7, 8 when ascending and also when descending (See Figure 1). For more information, visit the wikipedia page for modes of the melodic minor. 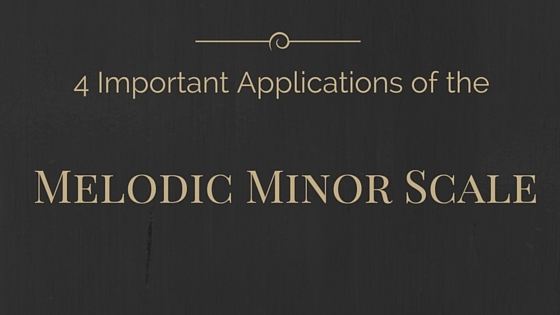 Four of the most important modes of the melodic minor scale include: melodic minor, lydian dominant, super locrian (altered), and lydian augmented. Each one of these modes is used regularly in jazz improvisation in different contexts, and is associated with a different chord. The melodic minor chord is associated with a min(Maj7) chord. The lydian dominant chord is associated with a 7(#11) scale (lydian has a #4 and dominant/mixolydian has a b7, so lydian dominant has both #4 and b7). The super locrian scale is associated with a 7(#9, b13) chord or 7alt chord. Lydian augment is associated with a Maj7(#5) chord, and is arguably used with less frequency than the other 3 important modes listed in the preceding paragraph. Here is the same melodic minor lick from C melodic minor used in all four contexts: Cmin(Maj7) (melodic minor mode), EbMaj7(#5) (lydian augmented mode) F7(#11) (lydian dominant mode), and B7alt (super locrian or altered mode). 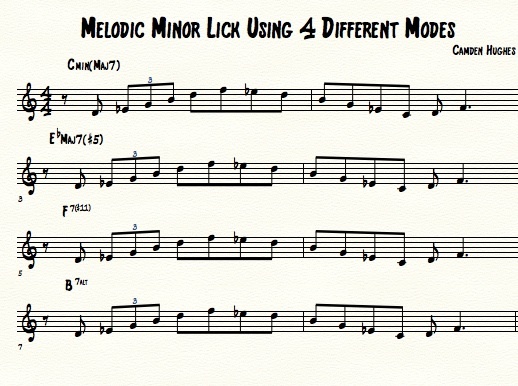 Hopefully this article and this lick shed some light on the melodic minor mode and how it can be used in jazz improvisation. There is much more to discover, but this should at least be a good start for some further exploration. For more information on the melodic minor modes, visit: Cool and Unusual Applications of the Melodic Minor Scale, Use of the Melodic Minor Scale In Stella by Starlight, and Melodic Minor Soloing Over a Minor ii-V7-i. For more info on other scales in jazz improvisation, visit: The 16 Most Important Scales in Jazz and Mastering Scales with Tetrachords Part 1 and Part 2. I would swap out the E flat major #5 and replace that with the A minor 7 flat 5 as a more "usable" forth melodic minor mode. From a chordal standpoint, using the right hand voicing, from bottom to top, E flat, G, A and D ( or A, D, E flat, G), we can slot in four different bass notes that will "define" the chord, as follows: C (C min/maj 7); F (F7#11); A (A min 7 flat 5); and B (B 7 Alt). Thinking in terms of upper structure triads ( e.g., G major triad) while both voicing these chords and soloing using melodic minor modes is also useful here. 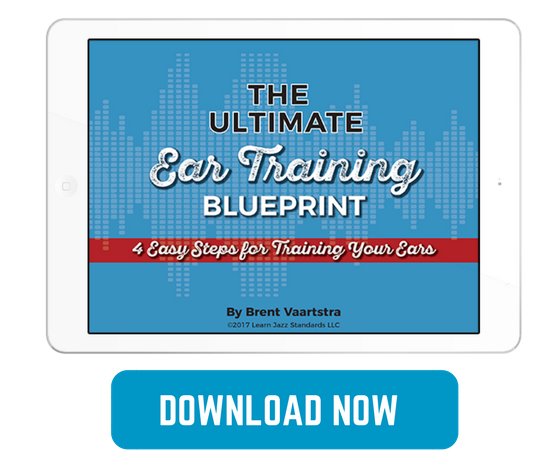 "The melodic minor scale has all of the same notes from the parallel major scale starting on the same note, except it has a b3rd instead of a natural third (since it is a minor scale)." The correct way of understanding the melodic minor is to consider it a natural minor with a raised 6th and 7th degrees. That is how it was derived and that's why it's called Melodic MINOR – because by raising the 6th and 7thm melodies with a leading tone are much easier to construct than when using the natural minor. Viewing the Melodic Minor is a major scale with a b3 is a shortcut way of playing the scale but will lead you to confusion if you try to understand the Melodic Minor that way: It must be understood as a minor scale, not a major scale. Hey Mikey, your analysis is understood. Ultimately, I think having some different ways to look at things is helpful.